If you're a Naruto series fan, you have to try ColourVue Kakashi contact lenses - black and red colored contacts that can be worn for a year. ColourVue Kakashi contact lenses have been inspired by Naruto series - Japanese manga and anime that has millions of fans around the world. Just like other Naruto contact lenses, Kakashi are black and red and provide an amazing effect when worn. 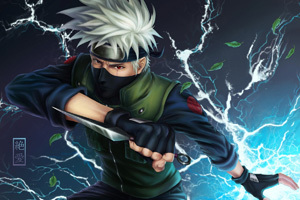 So if you're going for a cosplay event or a costume party of some sort, here's an idea for an outfit - Naruto Kakashi!